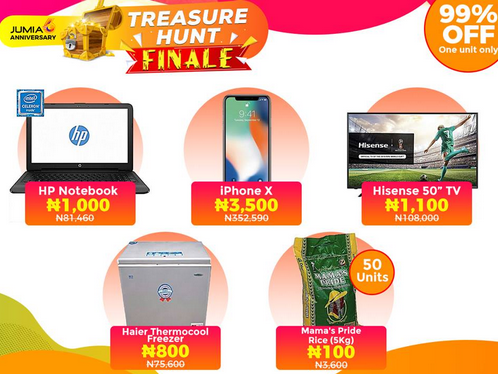 Jumia Treasure Hunt – Real or Fake? So I have been searching Jumia since the very first day Jumia anniversary began thinking I’ll get iPhone X for just N3,500 or deep freezer for N800. I’ve searched and searched and now I am tired. I thought this treasure hunt will be something simple but low and behold, not that simple. I’ve scattered Jumia site looking for HP Notebook for N1000, but disappointed and now I’m wondering if this is real or fake. Has anyone attempted thetreasure hunt on Jumia before? Nonsensical, “stupidify”, insane treasure hunt.. Who Jumia help.. Fake fake fake fake fake fake fake fake fake fake fake.. Seriously prof you are telling me that you believe Jumia. As for me all I have been looking for is a good discount but I gave up. Because what they do is raise the price of a product before slashing it back to the original price and paste a ridiculous discount percentage. Why will they sell those things at that price? Scam…….. i didn’t for one day believe this there rubbish. And am not interested. Just joking with peoples brain. lol. this one na scam of the highest order. That thing na the latest “realistic fake” scam. Those guys are looking people’s megabyte to drain. In the end, one of the zonal Manager’s relatives will receive a token in order to pretend to have won the treasure hunt. All marketing strategy, and nothing more. That which is legit is price slash down! I received their text messages about treasure hunt but I ignored it. I didn’t search for anything, maybe I will start searching now.